A spacious, comfortable studio vacation flat which is located on the lower ground floor of this excellent purpose built building, and very close to Londons' fashionable Sloane Square. The building benefits from lift and porter. 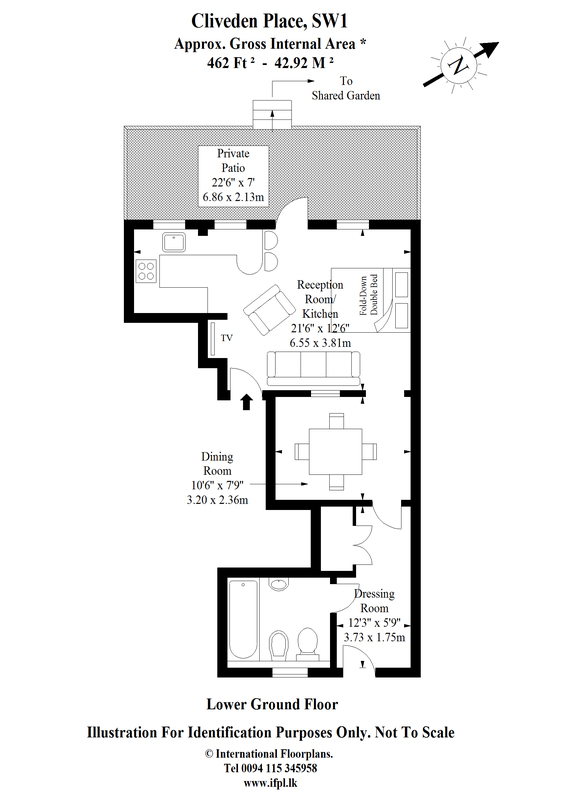 The studio room is a good size with sofa, armchair, 'pulldown' double bed and open with the well fitted kitchen. The kitchen has breakfast bar with 2 stools, oven, hob (stove top), fridge, microwave and good storage. There is a study/dining area just off the main studio room with table and 4 chairs. There is excellent storage in the dressing room with the bathroom next door which has bath with shower over tub, wash hand basin and loo. This apartment is a couple of minutes walk from Sloane Square and why not start your day with a delicious breakfast at Colbert which is on the corner of the square. The well dressed French style waiters will certainly look after you and the eggs benedict is highly recommended. You can shop at Peter Jones where the well heeled of Chelsea furnish their homes and with the Kings Road and Sloane Street with their huge variety of luxury shops you wont have too far to come home with all your supplies. The flip down bed is funky and contemporary and you can also enjoy outdoor patio space which is a real luxury in central London. With a porter on site and a modern well equipped kitchen, this is an ideal base in the heart of London.